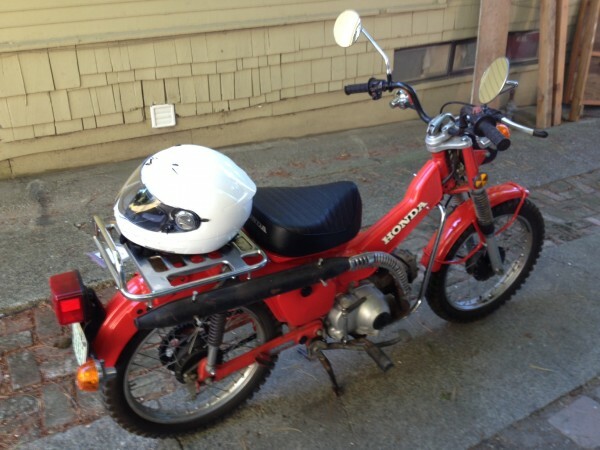 I’ll have a long wonky set of pages soon describing what this is all about, but to summarize I’ve been restoring a 1979 Honda CT90 and becoming a bike dude, within limits. So far it’s been a lot of buying parts and reading about solvents and oils and polishing creams. The other project is less tangible, I call it “tour simulation.” It’s meant playing a lot of open mics and small shows mostly out of town, trying out my new songs and a selection of old ones that work well solo. It’s been fun. Tonight I’m in Centralia at the Hub, and a few weeks ago I was at Toorcamp. Check out my Sun Tunnels Facebook page to see photos from that, it was weird. This entry was posted in Projects, Sun Tunnels, Travel. Bookmark the permalink.